A new technique (EP 1 499 894 B1 in EPO Bulletin 25.02.209 N. 2009/09; USPTO 7510687 in USPTO Bulletin 31.03.2009; ZL 03810029.0 in SIPO PRC Bulletin 08.04.2009) uses a solid phase made up of an immunosorbent polystyrene rod with 8-12 protruding ogives. 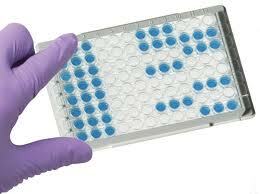 The entire device is immersed in a test tube containing the collected sample and the following steps (washing, incubation in conjugate and incubation in chromogenous) are carried out by dipping the ogives in microwells of standard microplates pre-filled with reagents. 4. The use of laboratory supplies for dispensing sample aliquots, washing solution and reagents in microwells is not required, facilitating the development of ready-to-use lab-kits and on-site kits.